Stretch out your travel budget and make the most of this money-saving transport and tour combo — a Viator Exclusive that you won’t find anywhere else! Head straight into the city with your round-trip Airport Express tickets, then use your full-day MTR (Mass Transit Railway) pass to travel wherever you want to go. 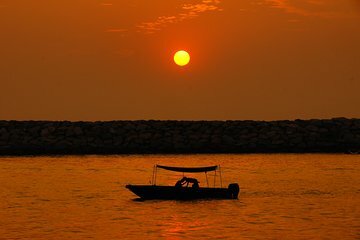 That's not all: enjoy a guided tour of Lantau island, including round-trip transport on the Ngong Ping Cable Car, a cruise around Tai O village, a 3-course dinner at the Tai O Heritage Hotel and an evening stargazing excursion. This ticket and tour combo, including round-trip Airport Express transfers, cannot be booked anywhere else! This tour includes multiple transport passes—MTR, Airport Express, and Ngong Ping Cable Car. I want to express my disappointment at the quality of the service that was provided. I arrived at Hong Kong international airport to pick up the vouchers as requested by your mail,only to find the China Travel Services closed. My flight landed at 21.30 and we could not contact anyone. I had to pay for our trip to the hotel. The following morning I managed to contact the China Travel Services, who then told me to come to the airport to pick up my vouchers. I then used the taxi again to the airport. I left my family at the hotel as the vouchers were to be used the same day. On arriving at the airport I was suprised to find that the China Travel Services did not have my vouchers. I then had to travel to the cable company by taxi and arranged for my family to also travel there via the metro. All said, this cost me more than 630 HK dollars to pick up vouchers for the activity. Whilst I had a unpleasant experience, I need to commend Angela and Andrew from the Ngong Ping 360 for their excellent service once we arrived at the cable car. I will be writing a full review on my return from my holiday outlinIng my experience and I will be looking at recovering these costs from Viator. Overall an Excellent tour . Guide and bus pilot were good and co-operative. Time was a bit short to visit big buddha and Po Lin monastery. Great value package and Lantau is a must visit. Was quite hard finding the lounge at the airport but not a problem once there. Airport express is a great way to get into HK. Cable car is a great experience. Wish had got s crystal floored car though! Tour guide was good and it was only us and her. Monastery and statue worth seeing. Then had coach to ourself to visit the fishing village. Good tour of the village and a museum. Boat ride was fun if not a little brief. No dolphins seen but can't be guaranteed of course. Then onto the Heritage hotel for a very nice meal on our own in the restaurant. Main criticism is that it's a sunset tour... The restaurant is a conservatory and all glass...except the wall facing West!! So you miss the sunset completely! Then back on the bus to a tiny street light lit beach...where you can't see the stars or hear the waves over the noise of the coach engine... Saying all that it was a lovely day and a good value deal. This tour was an amazing surprise! The starting point is pretty far from Hong Kong central area, but easy to reach by rail. When you arrive at the cable car, don't worry about the lines because you will get to go right to the head of the line via the special tour line. The cable car ride is amazing----majestic views. When you reach the top, you will find a little tourist type village but it is well done and there are visitors from all over. The monastery is nearby and it has a lot of wow factor for a Buddhist temple---very ornate and huge. The giant Buddha is impressive with manageable stairs that rise to its base. The next part was best for us. We were taken by bus to a very old Chinese fishing village which was the most authentic part of the trip. The houses on stilts were lived in by the fisherman and family members selling dried and fresh fish in the stalls along the streets of the market. There are also other things to purchase including shells and Chinese souvenirs. Then, a boat ride out into the South Chinese Sea to watch many dolphins jumping out of the water and it almost seemed like a show at Sea World! Finally, a stop for dinner, arriving by boat at the pavilion which led to a wonderful Inn that used to be a British police station. Beautiful dining on a hill overlooking the sea. The food was excellent. We took four tours while visiting Hong Kong and this was definitely our favorite. The tour guide was top notch and made the trip both interesting and fun! Don't miss this one! Very well planned and knowledgeable Guide.We covered all areas as described and had plenty free time to enjoy the sights. I would recommend this for a great day of sightseeing.I felt a great bargain for the experience. Everything that you imagine from the description and more. My boyfriend and I agreed that it was the best day of our lives. Our tour guide was amazing! But they still give you time to do your own thing. Everything from the crystal cabin to the dinner was perfect. Enjoyed the tour overall! Our tour guide Candice was informative and knew when to give us personal space to roam around. All day MTR pass and Airport Express is a definite plus. Was able to use the Airport Express on our second leg of the trip! Went during slow season for traveler s and we were the only ones of the tour. Felt like we had our own personal tour guide. Thought the 5.5 hour tour which includes Big Buddha, Po Lin Monastery and Ngong Ping Village was well thought out. A small boat taking us out to Tai O Heritage Hotel was an interesting experience. Taking it after sunset you can see the small flying fishes. Loved it!!! Food at Tai O Heritage was mediocre. Given the tour ends around 8:30ish-9PM. Would suggest grabbing food at either Temple Street Night Market, Chunking Mansion and/or on Wyndham Street. Es war ein toller Ausflug und wir können diesen jederzeit weiter empfehlen.